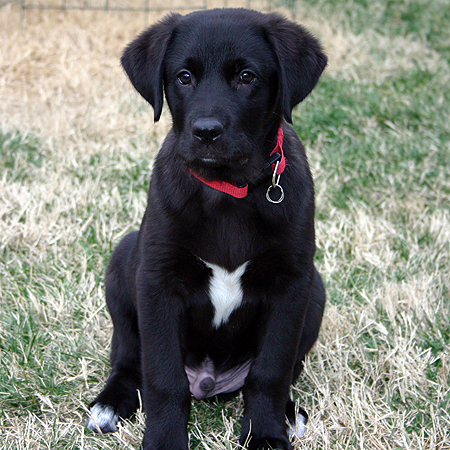 Tenor’s name has proven to be a good choice for this little Black Lab/Great Pyrenees mix, as we certainly have caught him “singing the blues” a few times already in his young life. Turns out, big brother Destin wasn’t quite as welcoming of our new four-legged friend as we hoped he’d be. In fairness, the mixed emotions on Destin’s part probably had something to do with the fact that Jersey left us just weeks after we got Tenor. The process of going from 2 dogs… to 3 dogs… to 2 different dogs sent a lot of mixed signals to each of the dogs — in terms of dog hierarchies & dog pack status issues. In brief: Two dogs are pets… three dogs are a pack! Every pack must have an alpha dog (that is, “the boss”)…and only one boss at that! But the lines become really gray the moment you add that third dog into the equation. Jersey was the oldest, so he should have assumed the role of Alpha early on. But he did not. Destin who had lived all his life as the Omega dog (lowest ranking) was now forced to assume the role of Alpha dog and learn how to run the show and try & figure out what this new little puppy was all about at the same time. …Add to this, the fact that all 3 of them were males, and you’re certain to have some interesting situations on your hands! In the early days, all of this confused the heck out of poor Destin — who until this time — had been the most mild-mannered, easy-going, 70-lb lap dog we’d ever seen. 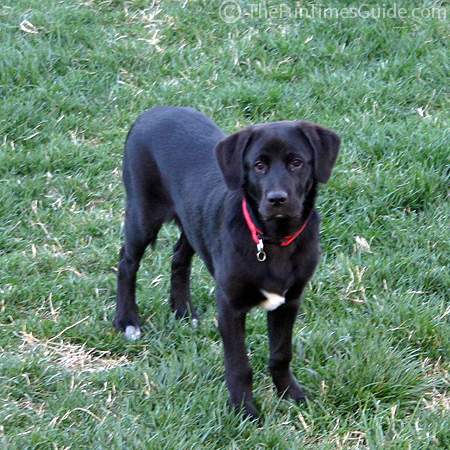 He’s a Black Lab/Golden Retriever mix and he’s got all of the qualities of each breed — very enjoyable to be around. In the end, as a result of all the dog-related changes in our household, Destin has grown a few more grey hairs under his chin, learned to be a little more “on guard” than before, and has learned to tolerate little Tenor — must like Jersey had learned to tolerate Destin when he was a puppy (…and they later became good buds). If Tenor looks at Destin funny, gets near Destin’s food, gets near Destin’s bones, or gets near Destin’s “favorite” toy… then all heck breaks loose. (Most toys are no problem… they’ll even play with the toys together. But one toy in particular Destin has claimed as his own.) And needless to say, we’ve learned to keep all those other things completely out of sight whenever the two dogs are playing together. He’s a sweet little pup with an old soul. He stares right into your eyes whenever you’re speaking to him, and because he’s seen what can happen when you do something “wrong” in our house (from Destin), he always aims to please — the first time around. sh, so he knows no other form of walking other than heeling. 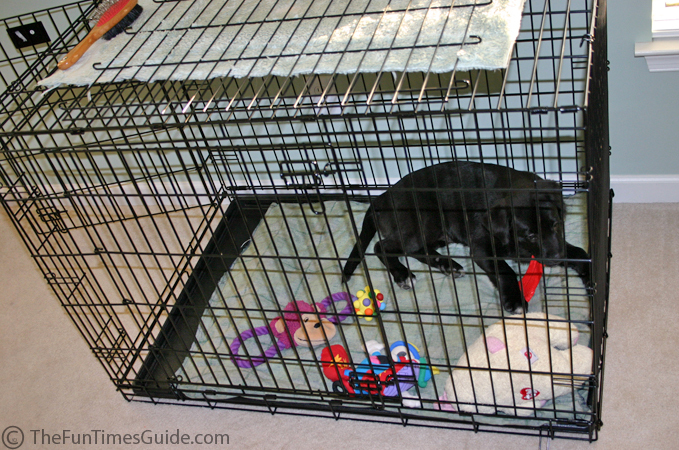 After a few housebreaking accidents, we taught him to “tell me” when he needs to go outside. So now he barks every time he needs to go out. He has been taught that he must “sit” before he gets anything from us. So, before he gets out of his crate, before he gets to run downstairs, before he gets his food & water, before he gets his favorite toy, before he gets a treat, and before he gets to go outside, he always “sits” patiently first. He’s a trooper at the vet — not afraid of people, other dogs, or even shots. He has survived the whole “teething” thing… after a week or so of rice and soft dog food, Tenor is now munching happily with a whole new set of teeth! He’s one of the most playful dogs I’ve ever had. He will play with any toy for hours (by himself!) and never tire of it. 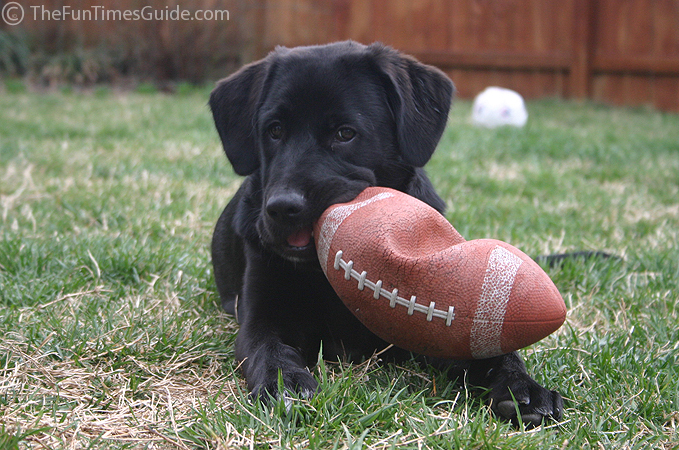 He especially likes balls, rope toys, and pressed rawhide (it’s different from “regular” rawhide chew toys). And, of course, his Kong! 2. Step him up to a big-dog raised food & water bowl. Destin’s been eating from raised bowls for years. (And Tenor is already tall enough to eat and drink from Destin’s “table”.) We’ve been told that raised food stations help to prevent “bloat“, which is common in large-breed dogs. As with Destin, we are thrilled with Tenor’s personality and characteristics. He’s looking like he’ll be a FUN dog, who learns quick, doesn’t mind playing 2nd fiddle, and is a people-pleaser. One of the most interesting things about Tenor’s “look” is the fact that he’s all black, yet he’s got a large patch of white fur on his chest, a tiny smudge of white fur underneath his chin, and white fur on the tips of three (3) paws. Those are the exact same places that Destin has white fur! 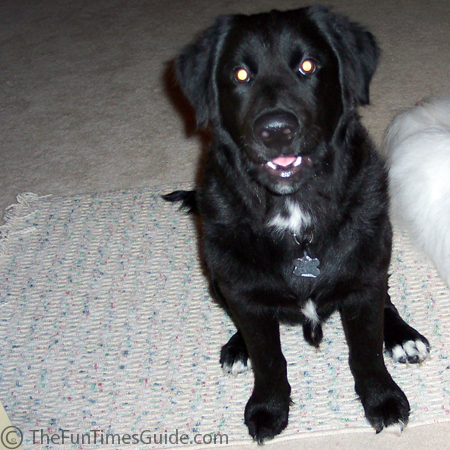 The only major difference between them is the fact that Tenor’s coat is more like a typical Black Lab (short-hair, water-repellent), while Destin’s coat is more like a typical Golden Retriever (long-hair, wavy, and also water-repellent). 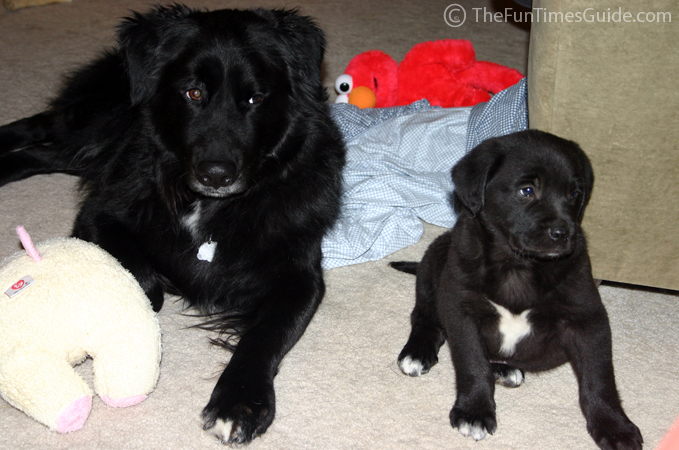 We feel confident that these two will grow to become best buds. As I said, they play very well together most of the time. They’re such a joy, it makes you smile just watching them interact.